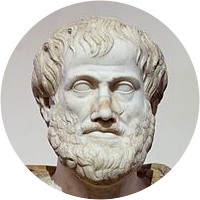 A collection of the best Aristotle quotations. What soon grows old? Gratitude. Law is reason free from passion. Moral virtue is the child of habit. A man is the original of his actions. What is justice? To give every man his due. Melancholy men of all others are most witty. Friendship is one soul abiding in two bodies. To run away from trouble is a form of cowardice. All we do is done with an eye to something else. It would be wrong to put friendship before truth. No great genius has ever been without some madness. In the naming of things one must go with the crowd. Of man in general, the parts are greater than the whole. Of mankind in general, the parts are greater than the whole. All art, all education, can be merely a supplement to nature. The good man thinks it is more blessed to give than to receive. Those who have never learned to obey cannot be a good commander. Everyone thinks chiefly of his own, hardly ever of public interest. My best friend is one who is wishing me well wishes, it for my sake. Good laws, if they are not obeyed, do not constitute good government. Whereas the law is passionless, passion must ever sway the hearts of men. Patience is so like fortitude that she seems either her sister or her daughter. The state exists for the sake of a good life, and not for the sake of life only. In educating the young we use pleasure and pain as rudders to steer their course. Dignity and nobility does not consist in possessing honors, but in deserving them. The young are in a state like intoxication, for youth is sweet and they are growing. To learn is a natural pleasure, not confined to philosophers, but common to all men. To be acceptable as scientific knowledge a truth must be a deduction from other truths. Virtue is a mean state between two vices, the one of excess and the other of deficiency. Poetry is something more philosophical and more worthy of serious attention than history. We will more easily accomplish what is proper if, like archers, we have a target in sight. The family is the association established by nature for the supply of a man's everyday wants. How many a dispute could have been deflated if the disputants had dared to define their terms. At his best, man is the noblest of all animals; separate from law and justice, he is the worst. Good has two meanings: it means that which is good absolutely and that which is good for somebody. At his best, man is the noblest of all the animals; separated from law and justice he is the worst. No man would choose a friendless existence on condition of having all the other things in the world. In the area of human life the honors and rewards fall to those who show their good qualities in action. The Good of man is the active exercise of his soul's faculties in conformity with excellence or virtue. Democracy arose from people who thought that if they are equal in any respect, they are equal absolutely. A man with a host of friends who slaps on the back every man he meets is regarded as the friend of nobody. Man is a goal seeking animal. Our life only has meaning if we are reaching out and striving for our goals. A king ruleth as he ought; a tyrant as the lest; a king to the profit of all, a tyrant only to please a few. The difference between an educated and uneducated man is the same difference as between being alive and being dead. If, in a word, it be in our power to do what is noble and what is disgraceful, it is equally in our power not to do it. All who have meditated on the art of governing mankind have been convinced that the fate of empires depends upon the education of youth. Inferiors revolt in order that they may be equal, and equals that they may be superior. Such is the state of mind which creates revolutions. One swallow does not make a summer, neither does one fine day; similarly, one day or brief time of happiness does not make a person entirely happy. It really lies in this: the one describes what has happened, the other what might. Hence poetry speaks of what is universal, history of what is particular. The greatest thing by far is to be a master of metaphor. It is the one thing that cannot be learned from others; and it is also a sign of genius, since a good metaphor implies an intuitive perception of the similarity in dissimilars. Happiness, whether consisting in pleasure or excellence, or both, is more often found with those who are most highly cultivated in their mind and in their character, and have only a moderate share of external goods, than among those who possess external goods to a useless extent but are deficient in higher qualities.